At any given time, there are thousands of trainees talking about the best bicep exercise, the best exercise for building their upper chest or the best supplements. Nevertheless, what people often forget is that there is more to building muscle then just doing hammer curls super-setted with incline bench. But what really makes a difference between any two athletes progress is their ability to recover. The faster you recover the harder and more frequent you can train, meaning more muscle growth. However, you cannot just hope for better recovery from your workouts, you are going to have to take direct steps to improving your bodies’ ability to recover. For 99% of individuals overtraining is not because of what they do inside the gym, but what they do outside of it. 2018 Update: I recently released my own book, which covers the science of the brain and stress. Supported by Olympic Athletes, World Champion Bodybuilders, IFBB Pro Bikini Competitors and more it is a very useful resource for learning to abolish stress and build a happier life which surely translates to better training results. It is a culmination of my work in the fitness industry, studying neuroscience at Harvard and offers a 100% money back guarantee. The first free step you can take to make sure you are getting optimal recovery from training is to be sure to relax and not be stressed out constantly. Overtraining is commonly thrown up, where it should actually be termed OverSTRESSING in most cases. As human beings, we constantly experience stress throughout our day, whether it be physiological such as high blood pressure or recreational drugs , psychological such as a job you hate or physical such as your time in the gym . We all have different amounts of stress that we can handle, and eventually if we just let our stress build our body as a whole will reach its limit. This can cause anything from sickness from a lowered immune system or depression due to lowered energy levels, and eventually halt your workout gains. However, luckily for us, the human body as a whole is designed to have ways to relieve stress buildup, to relax and recuperate. This is the ability that allows us to keep moving, the reason we can feel so overwhelmed and stressed one week but then feel much better the next week. This means the more ways you have to relieve stress, the more stress you can endure before “overtraining”. Which is why individuals such as myself can train six days a week, versus others who feel over trained just going for four or five. The key to being able to train more and recover better is to reduce the daily stress in your life, and constantly find new ways to relieve what stress you do have. Relieving stress can be as simple as going on a relaxing walk, listening to soothing music, reading, or even meditating. You will have to discover what relaxes you, for some people like me training itself can be relaxing mentally( but still stressful physically). Johnny is constantly stressed by his work, spouse, has no enjoyable hobbies and then adds training 1 hour 5 days a week to the mix. He will quickly find he isn’t recovering fast enough, and have to cut back his training again and again to make up for the other stresses in his life. While Chris loves his job, gets along fine with his spouse and has numerous hobbies he enjoys and starts training 1 and a half hours a day 5 days a week. Due to the fact his body is not under much stress elsewhere he will likely find the training load acceptable and profit normally. He will make great results and likely recommend the program to others. But if they are like Johnny and are already overloaded with stress elsewhere then their gains will be sub optimal or non existent. Phrases like “ It doesnt work for everyone bro “ will be thrown around and they may never realize why no one gained as fast as care free Chris. Nevertheless, maybe you already can control your stress level and want to even further optimize recovery. Another overlooked factor to losing weight or gaining muscle is sleep, it varies but most people need 6-8 hours of sleep per night to function 100 % efficiently. Studies have found a direct link between the amount of sleep an individual has and their Body Mass Index. Not to mention the obvious drops in performance lack of sleep causes as well. However, the length of sleep is not the only factor you need to address; you also need to make sure you stay asleep . The sleep cycle is made up of four distinct stages and each one is important in optimal recovery and rejuvenation. “Sleep Debt” is also important to note, which basically means if you do go without the required amount of sleep for prolonged periods of time you may have to make up for it by taking naps or sleeping up to 12 hours if possible . Sleep Debt is not perfectly linear, nonetheless I feel it is just something you should consider for finding the adequate amount of sleep in your life. Sleep is especially important for athletes competing in, or practicing a sport regularly as response time is normally the first ability affected by a lack of sleep. For just bodybuilding purposes sleep is also very vital as well, in certain stages of sleep our body produces growth hormone and cutting into this time can substantially reduce our ability to recover and eventually cause drops in strength performance . And as I have stressed before (Wow “stress” really is the word of the day huh?) optimal recovery is key to muscle growth. – Create a “Sleep Routine” in which you wake up and go to bed at scheduled times , this will make it much easier to fall and stay asleep each night and leave you feeling better rested in the morning. – Avoid stress and relax more at nighttime. 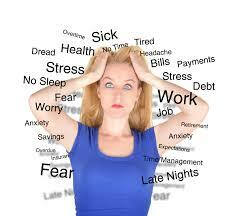 Just as cumulative stress causes our body to breakdown eventually, short-term stress can cause insomnia. – Avoid bright lights right before bed by turning off your computer and television, light suppresses our melatonin levels that help us fall asleep regularly. The same goes for smart phone and tablet reading before bed, grab a book or listen to some soothing music instead. -Keep your bedroom cool for optimal sleeping. The temperature of your surrounding area will affect the quality of your sleep because our bodies naturally fall asleep better in cooler places. Remember the faster you recover, the faster you grow bigger and stronger. If you avoid stress as much as possible, find ways to relieve what stress you do have and get enough sleep it will be very hard to “overtrain” and every workout will feel fresh, energetic, and successful. Another key factor is nutrition, but that will have to be discussed another day.